Since starting work on Kapwing, I’ve noticed a lot of buzz in the Silicon Valley about cloud costs “dropping dramatically.” Entrepreneurs, VCs, and the media write about this trend, claiming that it’s enabled a new wave of startups in fields like artificial intelligence and large scale data processing. Many editorials allege that new tech and increased competition has brought down cloud costs dramatically over the last few years - fueling new, valuable companies. It’s my belief that artificial intelligence is one of the most exciting and transformative opportunities of our time. There’s a few reasons why that’s so … The costs of compute and storage are both plummeting by orders of magnitude, while the computational capacity of today’s processors is growing. Clearly, many bright minds are bullish on the rapid decrease in cloud costs and the subsequent rise of innovative startups that can ride this wave. 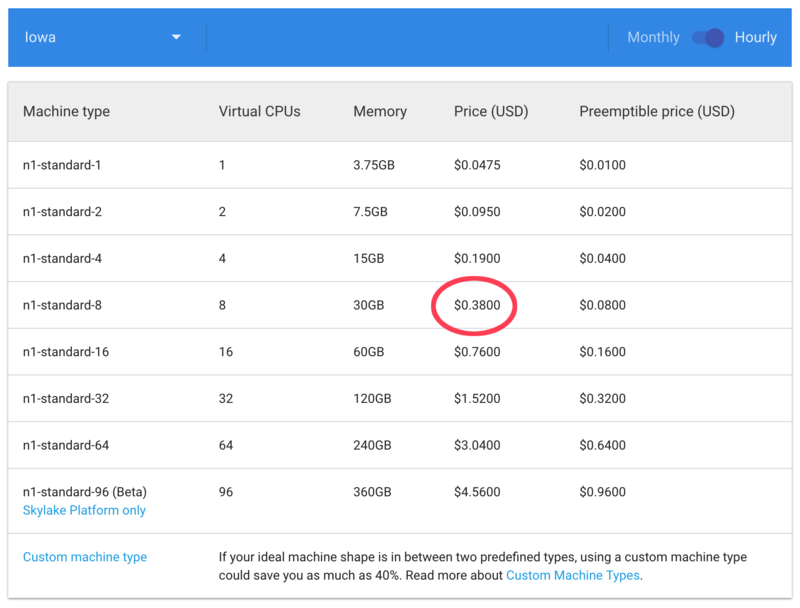 But are cloud prices actually falling? I have often made this claim myself as the founder of a startup that relies on cloud storage and processing. But after a month of expensive cloud costs, I wanted to validate this trend by looking at historical costs. Because cloud offerings are so varied, there can be many different ways to measure cost. However, there are two main areas that matter for any startup: compute and storage. 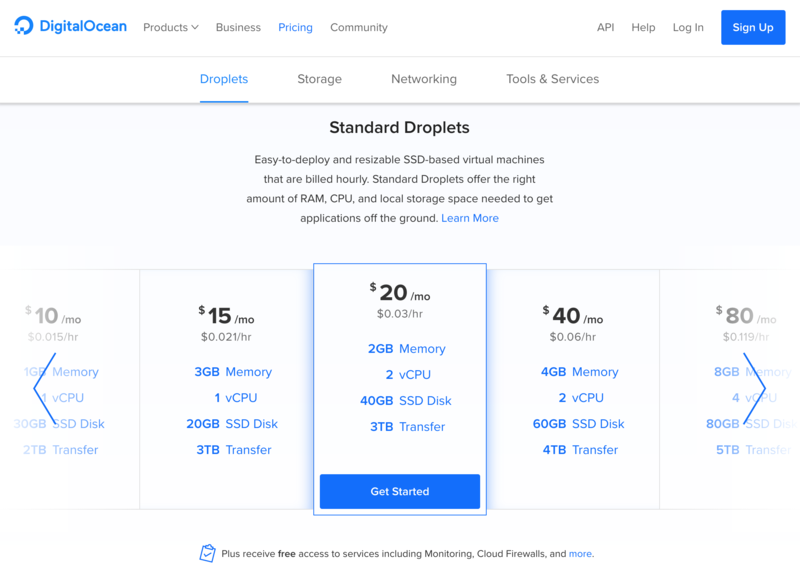 I dove into the Internet Archive to see if the prices for these cloud services were actually falling “dramatically” and found that the trends were not as obvious as many claim. 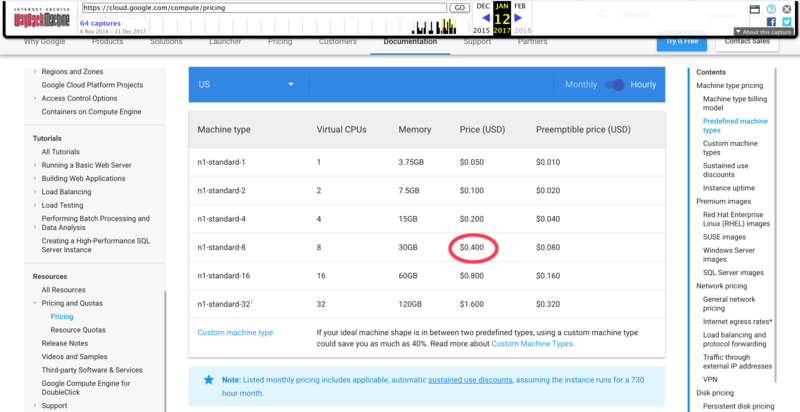 I looked at pricing on the Google Cloud Platform for both Compute Engine (Google’s VMs, competitor to AWS EC2 Instances) and Cloud Storage (similar to AWS S3). I used the Internet Archive to compare pricing back to 2014. For the sake of comparison, I focused on n1-standard-8, a standard offering, priced at $0.38 per hour. Note that, as of this year, these prices depend on the server region - this screenshot is of the default region (Iowa), which is generally cheaper than other options. The pricing for the same n1-standard-8 was $0.40 per hour two years ago. This 5% price drop over two years is hardly an order of magnitude better. The current prices of VMs in Northern Virginia today are actually more expensive ($0.425). So Google Compute Engine prices dropped 20% between 2014-2016 and 5% from 2016-2018. For certain locations, Google Compute Engine costs have not dropped at all in the last two years. A drop exists, but it seems far from “dramatic”. If computing power isn’t dropping by an order of magnitude, then perhaps some of the excitement stems from the falling price of storage. A dramatic drop in storage (and associated data transfer) costs would enable smaller companies to run analysis on large data sets and move more data to the cloud. Using the internet archive, we can compare the today prices to those from December of 2014 (the earliest snapshot available, from over 3 years ago). 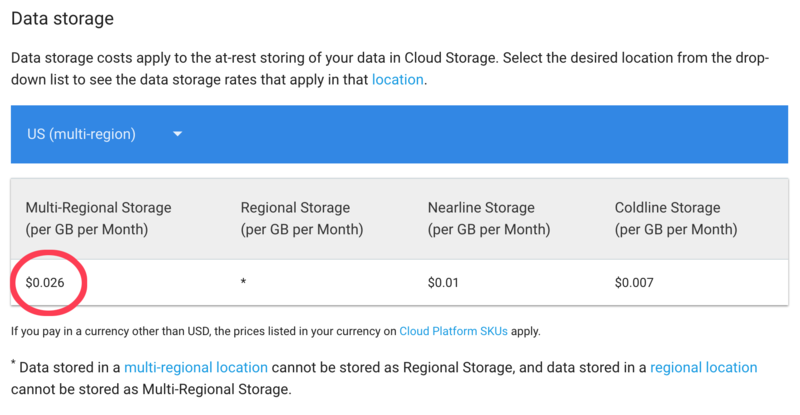 Surprisingly, the main costs of Google Cloud Storage haven’t changed at all since the earliest snapshot available in the Internet Archive - over 3 years ago. If your startup has been counting on cloud costs to fall, you haven’t had much luck for the last 3 years. What about AWS, or other cloud providers? 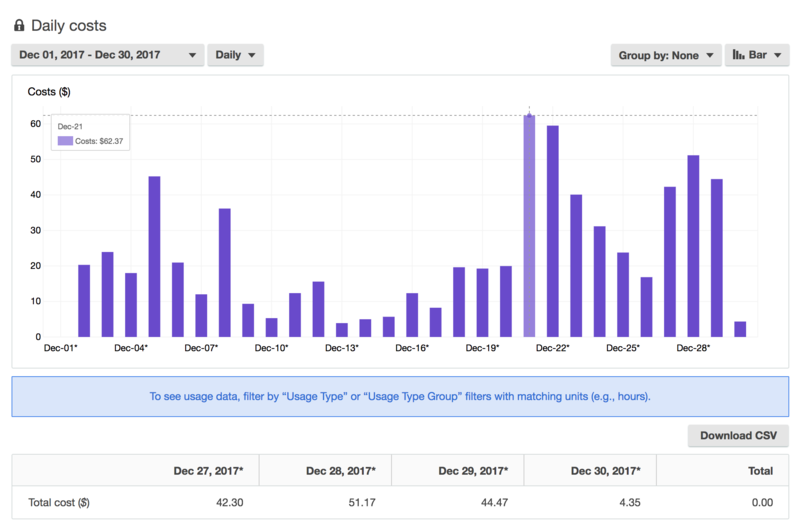 I chose to do analysis in this article on Google Cloud for the sake of consistency, because the pricing pages are more clear. 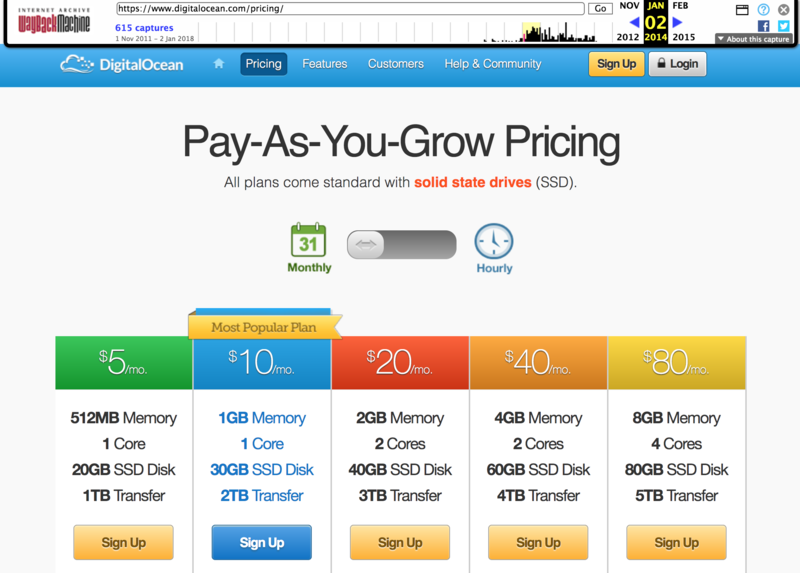 The AWS pricing pages are much more nuanced and do not show prices as clearly. But if we look through the AWS News Blog for articles on price reductions for AWS instances, we’ll notice that the last US based price reduction was back in November 2016, meaning that AWS didn’t cut prices for cloud services in the US at all for all in 2017. And in the price reduction of November 2016, only Northern Virginia machines were affected. 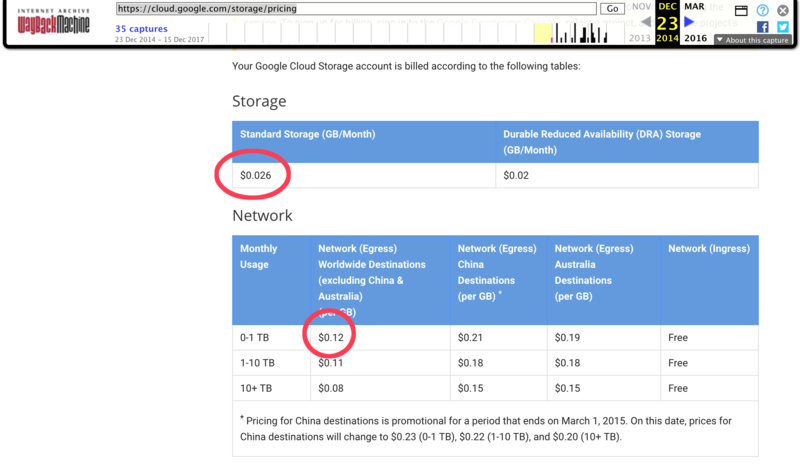 Even in that specific region, price cuts were consistent with what we see with Google Cloud - around 5%. Hardly the order of magnitude drop that many have been waiting for. A full analysis of other top cloud providers is out of scope for this article, but a cursory observation of top US-based cloud providers shows a similar trend (or lack thereof). 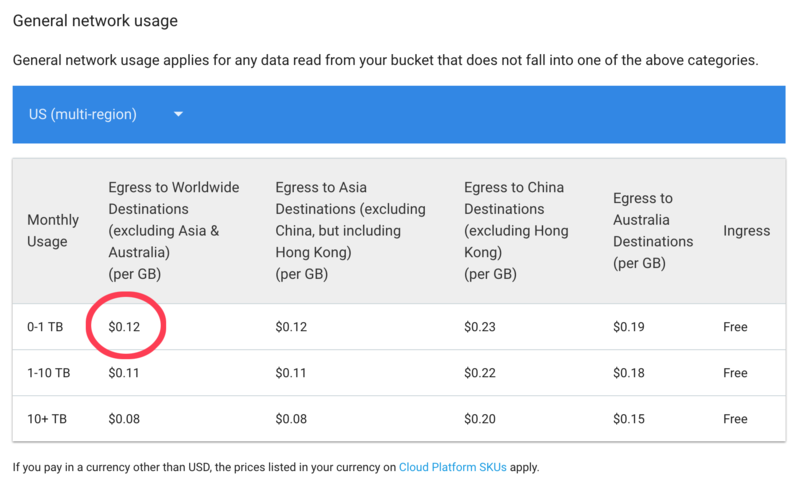 For example, if we look at the current pricing plans for Digital Ocean, another leading cloud provider, we can see that their standard plan with 2G Memory, 2 cores, 40BG SSD, and 3TB transfer costs $20 / month. Now we can compare this to their prices from January of 2014, four years ago. You can see that paying $20 / month (in red) will buy the same exact cloud setup as today. For Digital Ocean, cloud costs haven’t come down at all in the last four years. Many leading cloud providers exhibit the same sticky prices. The rise of artificial intelligence is undoubtedly an important trend, but the idea that new companies will emerge as a result of dropping cloud costs isn’t supported by the data. We can already see evidence that startups that bet on this trend are in trouble. Last month, the popular video sharing platform Vidme shut down, citing an inability to build a sustainable business. Storing and delivering video is becoming less expensive, but remains extremely costly … When we launched in 2014, we projected that infrastructure costs would decline due to increased competition in the CDN and data storage industries. While marginal prices have fallen dramatically over the past few years, our aggregate costs still outpaced our ability to generate meaningful revenue. Cloud costs may have dropped a little, but not anywhere close to enable a meaningful new wave of startups betting on this trend. Our product, Kapwing, is an online video editor. When we started, we also bet on storage prices to fall. But, we quickly realized that if we didn’t get our cloud costs under control, we would quickly be spending a ton of money. Even uploading and downloading only around 500 short videos a day was costing us over $50 a single day in network transfer fees. Some days our S3 bill would be over $100 dollars. For the month of December, our AWS bill was over $600. That might not seem like a lot of money to a big company, but it is a lot of money for a bootstrapped startup in its early days of life. It took a considerable engineering effort to bring this spend under control. We stopped allowing file hotlinking, we removed uploads after a certain period of time, and we got smarter about how we upload and download videos. When we first started, we assumed that cloud costs were so low that they weren’t something we would have to worry about until we were at a fairly large scale. Instead, they turned out to be something we needed to worry about from day 1. The promised dramatic drop of cloud costs hasn’t come, and doesn’t seem to be coming. Artificial intelligence startups will certainly still rise, but their success will not be fueled by a drop in costs. Rather, their success will come in the form of deep pockets of VCs or partnerships with large players to access the necessary infrastructure to create meaningful technology. This necessity means that the next great wave of startups might not be artificial intelligence companies at all, but rather businesses built on a solid financial foundation from the beginning.